Who is Steven Chase Brigham? 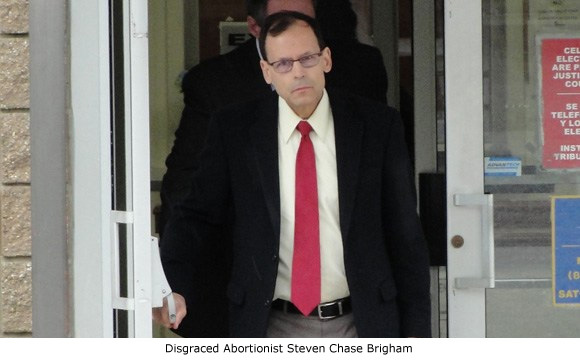 Steven Chase Brigham is a disgraced New Jersey abortionist who, despite having no valid medical license in any state, continues to operate a chain of at least 13 abortion facilities, primarily under the American Women’s Services banner. His known abortion operations span Maryland, New Jersey, Florida, Virginia, and the District of Columbia. Operation Rescue considers him the worst living abortionist in America that is not currently incarcerated. Understanding him and how his abortion chain operates is important. Since his shady practices are frequently employed by other abortion providers, awareness of Brigham’s schemes can bring new insights into the inner workings of the Abortion Cartel as a whole. Brigham has a 30-year history of disciplinary action and run-ins with the law, which have schooled him in how to exploit legal loopholes and evade accountability. Brigham is well known for his deceptive, corners-cutting practices. In fact, Brigham’s abortion operation is so dangerous that the National Abortion Federation, an association of abortion clinics that are ironically known to be among the shoddiest, revoked his membership years ago. There is ample evidence in Brigham’s record to conclude that Brigham has learned to use deception to skillfully manipulate employees, property managers, vendors, medical boards, health inspectors, administrative judges, and nearly everyone else. His now fading-good looks, charismatic personality, and ability to tell people exactly what they want to hear has kept him in business in spite of his troubles. Brigham could easily be defined as a modern-day con man, huckster, and swindler. The abortionists he hires to operate his facilities are a regular “rogue’s gallery” of misfits and criminals, some of whom he uses as unwitting pawns to keep the money flowing into his ever-growing spider-web of business entities that are used to conceal his true ownership and control from the authorities. Yet, Brigham always seems to be in the midst of financial difficulties, unable or unwilling to pay his bills. This has resulted in multiple evictions and/or foreclosures on his office sites over the years. Below are categorized facts related to Brigham’s misdeeds with links to broader articles and supporting documentation. Also included is a listing of abortionists he employs or has employed, along with links to documentation related to their own legal and disciplinary issues. Brigham was once licensed to practice medicine in six states: California, Florida, Georgia, New Jersey, New York, and Pennsylvania. The chart below lists the status of his licenses in each state. Note that he currently has no active medical license in any state and is forbidden to practice medicine anywhere. Brigham’s educational background is actually quite impressive. He graduated from MIT in 1978, and from Columbia Medical School in 1986. While in medical school, he served a two-month rotation in an emergency room. After graduation from Columbia, he served a one-year internship in the field of Internal Medicine. Around 1990-1991, Brigham began to engage in the practice of abortion, something he found “rewarding” since he was “helping women.” However, evidence shows that he was unqualified to do them. Almost immediately, Brigham ran afoul of licensing authorities. He also falsely claimed he was an “emergency room physician,” even though he had never completed a residency in emergency medicine – or any other discipline – nor has he ever held a full-time position in an emergency room. When the Florida Medical Board revoked Brigham’s license, their documents cited that Brigham’s medical training ended with a 1-year internship in Internal Medicine. As far as his qualifications to conduct abortions, his so-called “training” in abortion procedures consisted of “limited interludes of observations of other physicians,” which could account for the egregious botched abortions he has been known to commit. [Brigham] repeatedly exaggerated his medical training and skill. In both the acts established by the charges herein as well as his testimony, [Brigham] has demonstrated he lacks appropriate judgment and insight as to his own limitations. He routinely displayed a tendency to inflate and embellish the truth. . .[Brigham] later admitted he did not complete the course in first trimester abortion practice offered by Planned Parenthood, nor did he receive a certificate. Eventually, [Brigham] testified that what he referred to as special training in preparation for his activities in the abortion field consisted of limited interludes of observations of other physicians. According to Real Choice, a pro-life blog that has conducted extensive research on the abortion industry, it was Planned Parenthood who recruited Brigham to become an abortionist in the first place. Mark Brunhill is a now-deceased abortionist who formerly served as Medical Director of the Margaret Sanger Planned Parenthood in New York City. His association with Planned Parenthood dates back to 1965. He also served as Vice President of the National Abortion Federation. Burnhill served as a witness on behalf of Brigham in 1996, and aided Brigham in getting his New Jersey medical license reinstated. Brigham was a member of the National Abortion Federation and attended their annual meetings. Today, the NAF publicly condemns Brigham, and even has a warning about him on their web site. On February 10, 1998, Brigham was convicted in New York of one count Felony Scheme to Defraud and two counts of Misdemeanor Failure to File Corporate Taxes. He was sentenced to 120 days in the Albany County Penitentiary, placed on five years of probation, and ordered to pay nearly $30,000 in fines and restitution. One California Medical Board disciplinary document alluded to the possibility that Brigham committed Medicaid fraud (receiving MediCal payments while his license was suspended), but Operation Rescue could find no confirmation that Brigham was ever criminally convicted of that charge. 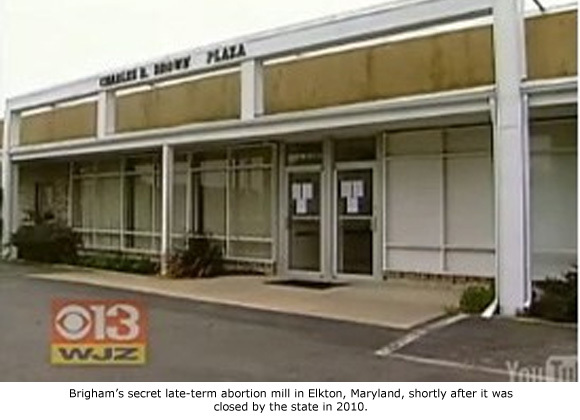 In September 2010, Brigham and an associate were involved in a seriously botched late-term abortion at a clandestine abortion facility in Elkton, Maryland. His suspicious behavior at the emergency room prompted hospital staff to call the police and a treating physician to file a complaint against him. That episode prompted criminal and administrative investigations that concluded Brigham had engaged in the unlicensed practice of medicine in Maryland, where he had never held a medical license. As a result, his New Jersey medical license – his last license – was revoked in 2014. Operation Rescue has received numerous tips, despite the fact Brigham is unlicensed, that he may still be conducting abortions secretly. So far, Operation Rescue has been unable to independently verify these rumors. Nevertheless, given what we know about him through our extensive documentation and through information provided to us by confidential informants that know the man, it seems highly likely that the reports could be true. Anyone with information that Brigham is indeed still practicing anywhere in the U.S., please contact Operation Rescue. 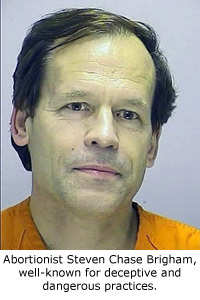 Brigham was arrested on December 29, 2011, and charged in Cecil County, Maryland, with five counts of first-degree murder and five counts of second-degree murder related to the discovery of 34 late-term aborted babies found by police in the bloody freezer at his clandestine Elkton facility. His associate, Nichola Riley of Utah, was charged with one count of first-degree murder and one count of second-degree murder. The pair were each charged with one count of conspiracy to commit murder. The charges are the result of a Grand Jury investigation into his illegal late-term abortion scheme involving New Jersey and Maryland. While late-term abortions are not illegal in Maryland, those who kill viable babies killed in the commission of crimes can be charged with murder in that state. Unfortunately, an expert witness for the prosecution who would have testified that the babies died in Maryland, not New Jersey, pulled out of the case, resulting in the charges being dropped. In Brigham’s 1996 Florida license revocation documents, and a New Jersey Final Disposition document several botched abortions were described. •	New Jersey, July, 1992: In preparation for a 22-23-week abortion on a 22-year old woman Brigham inserted laminaria cervical dilators. When Brigham inserted the second round of luminaria dilators the next day, he ruptured the patient’s membranes. Instead of sending her to the hospital, as he should have, Brigham violated the standard of patient care by giving her antibiotics and instructing her to report to one of his New York clinics the following day for completion of her abortion. The patient, who rode home on a motorcycle, developed an infection that evening and was rushed to the emergency room where she was admitted into the hospital for treatment and delivery of her dead baby. •	New York, May 7-9, 1992: Brigham conducted a D&E abortion on a woman who was 24.5 weeks pregnant, during which he perforated her uterus and pulled out visible parts of the omentum (tissue that covers and supports the intestines). His unskilled use of forceps caused an 8-10 centimeter laceration of the posterior uterus, perforated the lower part of her colon, and damaged both ureters. Despite his patient’s obvious injuries, he continued the abortion. She was later transferred to a hospital where she arrived in shock required emergency surgery, including a colostomy. •	New York, November 10-11, 1993: Brigham conducted a D&E abortion on a 20-year old woman who was 26 weeks pregnant. During the abortion, Brigham lacerated her lower uterine segment, her posterior uterus, and uterine artery – probably due to the difficult extraction of the skull that had sharp “fetal skull plates. . . extruding from the side of the decompressed fetal skull.” Brigham ignored her profuse bleeding for four hours until he finally agreed to transfer her to the hospital, where she arrived in hypovolemic shock, a life-threatening condition that results from rapid loss of more than 20% of a body’s blood volume. She underwent a complete emergency hysterectomy. Brigham was accused of failing to adequately dilate his patient’s cervix prior to attempting the dismemberment abortion on a 26-week baby, resulting in the internal injuries and failing to call for emergency care within an appropriate time frame. With the help of his own self-serving testimony, which was supported by testimony from other abortionists covering up for one of their own, Brigham was later found not to have violated the standard of care. •	New Jersey, October 26, 1993: Brigham conducted an abortion on a 14-year old girl who was six weeks pregnant. Because the patient was crying and anxious, Brigham pushed a “wad” of gauze in her mouth in order to prevent other patients from hearing her cry, and then proceeded to heavily sedate her. After her abortion, the teen’s condition appeared to alarm the attending nurse, whose account of the incident was — unsurprisingly — significantly different from Brigham’s. The patient was extremely drowsy, and her oxygen rate fell dangerously low. She had to be stimulated to take a deep breath. Once the patient was stabilized, the nurse strongly objected to Brigham for gagging his young patient and for other lapses in her care. Despite Brigham making extensive promises to her, she quit her employment with him in protest. However, due to witness testimony from other abortionists, Brigham was found not to have violated the standard of care. •	New Jersey, Date Unknown: Brigham conducted an abortion on a woman who was 11-12 weeks pregnant. Afterward, the patient complained of severe abdominal pain. Two days after the abortion, Brigham examined the patient, diagnosed her with a slight infection, prescribed antibiotics, and told her to return in two weeks. Still in horrific pain, the patient later sought help from a hospital emergency room where it was discovered that she had an abscess that was likely the result of a uterine perforation. After the discovery of these incidents, on December 14, 1994, the New Jersey Board of Medical Examiners ordered Brigham to halt the practice of medicine in the State of New Jersey. However, the testimony from other abortionists, including Planned Parenthood leader Burnhill, helped Brigham clear his license and resume his reckless abortion practice. Because of this, the number of abortion injuries attributable to Brigham only continued to swell. 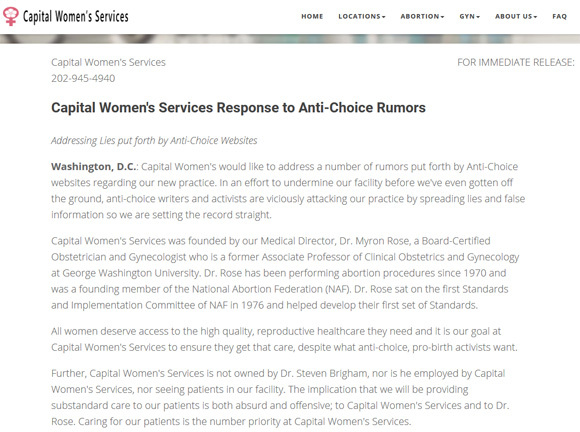 Today, despite its lengthy laundry list of patient safety and legal problems, Brigham’s American Women’s Services website boldly displays the logos and various organizations – including health departments in three states — that seem to have somehow put their stamp of approval on Brigham’s nefarious abortion businesses. Nothing could be more deceptive. In reality, Brigham’s Virginia Health Group in Fairfax, Virginia, was forced to close July of 2016, after the Virginia Department of Health suspended its facility license due to a failed inspection that resulted in 52 pages of health and safety violations. “In aggregate, the deficiencies pose a substantial threat to the safety of patients and staff of the Virginia Health Group,” wrote State Health Commissioner Marissa J. Levine in an April 6, 2016, letter notifying the facility of the immediate suspension of its abortion facility license. “Evidence of wrongdoing at Brigham’s American Women’s Services facility in Fairfax is part of a clear pattern of repeated and serious misconduct that poses a significant threat to patient safety, and which cannot be allowed to go unchecked in Virginia,” wrote Saporta in a statement to the Washington Post. The rest of the “credentials” listed on the AWS website are likely just as bogus. In 1992, Brigham was forced into “voluntary retirement” in Pennsylvania in order to halt a licensing investigation against him. He has been banned from operating or holding any interest in an abortion business in Pennsylvania since July 2010. Yet, he has illegally continued efforts to operate there. In 2013, Brigham opened Integrity Family Health in Philadelphia and employed abortionist Eric Yahav to work there. It was forced to closed by the state later that year after pro-life groups filed complaints linking Brigham to the facility. All four of Brigham’s Maryland locations had their surgical facility licenses permanently suspended on May 9, 2013, after health inspectors found egregious violations, including a patient death and dangerously administering an injectable abortion drug by mouth. Nevertheless, three of the facilities never really closed and they continue selling medication abortions – the very thing that caused their surgical licenses to be revoked in the first place. In September 2015, Brigham’s Premiere Ob/Gyn abortion facility in Wilmington, Delaware, was forced to halt surgical abortions after the Delaware Division of Public Health threatened to shut them down. He continued operating the facility by dispensing abortion drugs until he was finally evicted in March 2017, for non-payment of $37,000 in back rent, sticking the landlord with the unpaid bill. These are just a few of the most recent examples of the most recent of Brigham’s facility licensing and dubious financial dealings. He has filed for bankruptcy numerous times over the years, leaving creditors high and dry. The most recent was a 2016 filing to avoid paying a monetary judgement of $6.5 million to a family in a malpractice case. As Brigham was about to be evicted from his Delaware office for non-payment of rent, he opened Capital Women’s Services, a new abortion facility in Washington, D.C.
Operation Rescue first learned of the D.C. office through a confidential informant who was once close to Brigham. The informant also provided information about the facility’s medical director, Myron Rose, who also works at Brigham’s Maryland abortion offices. In fact, Rose’s address listed on his Maryland medical license is a known Brigham abortion facility in Baltimore. However, Operation Rescue stands by its claims that Brigham owns the business, or at least controls it through the United Health Group, LLC, which was first registered on March 9, 2017. It is located at 100 Springdale Road #A3-101, Cherry Hill, New Jersey 08003. A google search of that address showed it belonged to a P.O. Box inside a UPS Store near Brigham’s Voorhees headquarters. 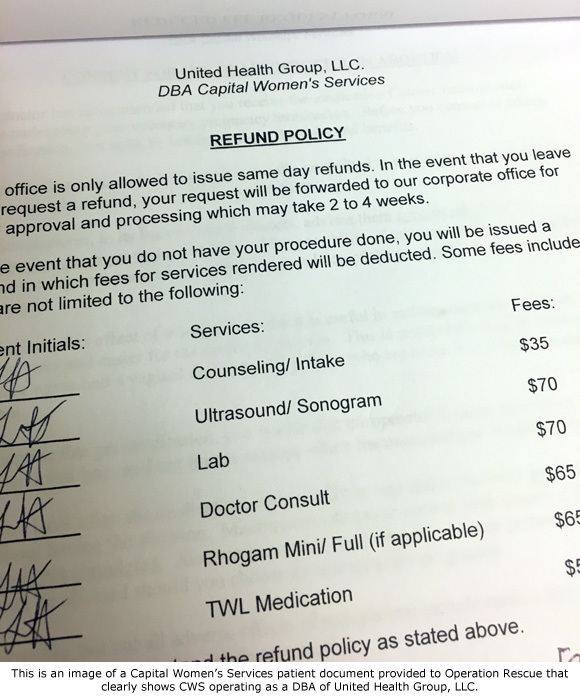 Operation Rescue would not have known about this new abortion office or Myron Rose if it had not been for information provided by the confidential informant’s details of Brigham’s business operations. This information completely debunks the Capital Women’s Services notice that attempts to distance itself from Brigham. The 22 abortionists who are or have been affiliated with Brigham abortion facilities have a laundry list of issues. The chart below summarizes them. Operation Rescue continues to work through the legal process to shut down Brigham’s dangerous and deceptive abortion scheme. “We won’t stop until every Brigham abortion facility is closed and he is in jail where he belongs,” said Newman.